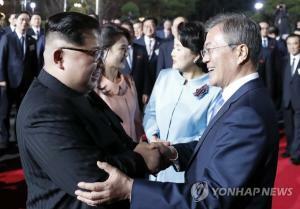 Former Chief Secretary Moon Jae-in for the late President Roh Moo-hyun (2003-8), now President of the Republic of Korea, campaigned in 2017 for President following the impeachment of former President Park Geun-hye, vowing not to build any new nuclear power generation reactors. At the time, five reactors were under construction, three of which were near completion (Shin Kori (SKN)-4; Shin Hanul-1 and -2) and two of which had just started (SKN-5 and -6). After Moon was sworn in, construction was suspended on SKN-5/6 in July 2017 and an independent panel was convened to evaluate continuing construction. 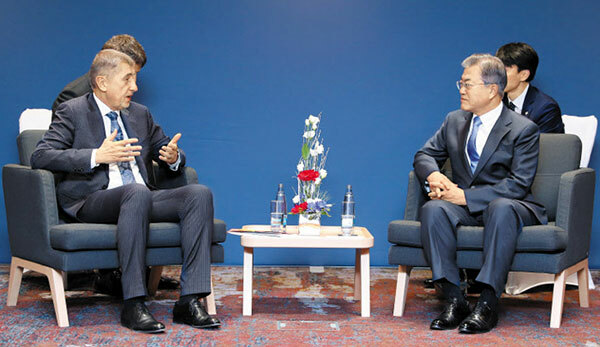 President Moon Jae-in (right) and Prime Minister Andrej Babis of the Czech Republic discuss matters related with Korea’s nuclear reactor sales diplomacy during their summit meeting at the Hilton Hotel in Prague on Nov. 28, 2018. After hearing from 471 citizens, the panel recommended that construction resume on SKN-5/6 in October 2017 by approximately a three-fifths majority. 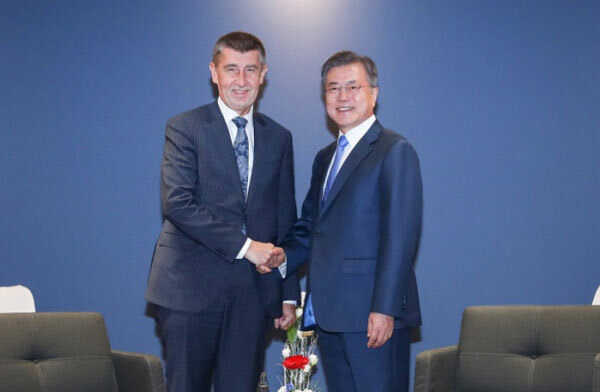 President Moon visited the Czech Republic on Nov. 28 this year, met with Prime Minister Andrei Babis and asked him for assistance in our effort to win a contract for the construction of nuclear power generation facilities in Czechia. According to a report by Korea’s leading newspaper, Chosun Ilbo, on Nov. 28, 2018, the Czech Republic has a total of six nuclear power plants in operation, which are known to supply one third of the total power demand of the country. And the country is now trying to build two or three more such plants. President Moon Jae-in (10th from left, front row) poses with the leaders of the United Arab Emirates in front of the Korean-built nuclear power plant construction site in the UAE. On this point, President Moon is improving his image among the Korean people as did former President Lee Myung-bak had done while in office in 2009 and ultimately won the nuclear power plant construction contract from the United Arab Emirates. In the case of President Moon, however, the Korean people are somewhat confused. As aforementioned, President is somewhat not all that enthusiastic about continuing nuclear power generation development in Korea and in other parts of the world by the Korean nuclear power construction companies. 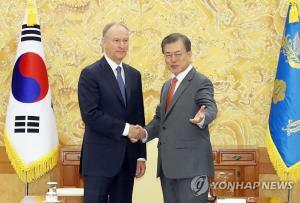 President Moon makes many people baffled as far as his position on the nuclear power plant construction is concerned. President Moon Jae-in (right) shakes hands with Prime Minister Andrej Babis of the Czech Republic at the Hilton Hotel in Prague of Czech Republic on Nov. 28, 2018. Last June, about a month after his inauguration as the 20th-term President of Korea, President Moon declared, “Nuclear power generation is neither safe nor cost-saving and furthermore it is not environment-friendly and we should do without any more nuclear power plants.” Then he scrapped all the new nuclear power plant construction plans, gave up the extension of the life-span of the existing nuclear power plants, and declared the close down of Wolsung Nuclear Power Plant #1. Shin Hanul 1and 2, Nuclear Power Plant in Korea. However, in the opinion of experts, when the construction of Reactors 5 and 6, which are now under construction, is finished, there will be no more work for the builders of the nuclear power plants. As they see no future in the construction of new nuclear power plants in Korea, no one wants to enroll for matriculation at the nuclear power plant-related courses at the universities in Korea. 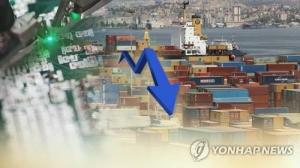 Exodus of the Korean people involved in the nuclear power generation is limited to the universities. The production companies of the parts and assemblies of the nuclear power plants are implementing downsizing plans as the workers continue to leave affected by the government policies to put an end to any further nuclear power generation. Experts estimate the future nuclear power plant market at several hundred trillion won (US$446 billion). A total of 454 nuclear power plants are known to be in operation throughout the world and additionally 56 are under construction while 89 more are in the processing planning with construction in mind. Shin Kori (SKN) 4, Nuclear Power in Korea. Now in Korea, opinion continues to grow to give up the denuclearization plan and in favor of resuming and further expanding its nuclear power generation sales diplomacy. President Moon Jae-in now in the Czech land performing the work of a nuclear power generation salesman appears to be his affirmative response to this demand growing in also in Korea. According to Wikipedia, the total electrical generation capacity of the nuclear power plants of South Korea is 20.5 GWe from 23 reactors. This is 22% of South Korea's total electrical generation capacity and 29% of total electrical consumption. 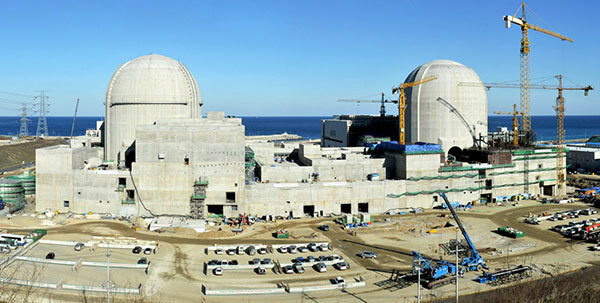 Shin Kori (SKN) 5 and 6 Nuclear Power construction site in Korea. 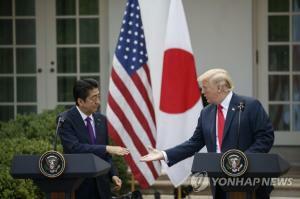 Responding to widespread public concerns after the Fukushima Daiichi nuclear disaster in Japan, the high earthquake risk in South Korea, and a 2013 nuclear scandal involving the use of counterfeit parts, the new government of President Moon has decided to gradually phase out nuclear power. The three reactors currently under construction will be completed, but the government has decided these will be the last built, and as the existing plants close at a 40 years end-of-life they will be replaced with other modes of generation. In 2012 the ROK had plans for significant expansion of its nuclear power industry, and to increase nuclear's share of generation to 60% by 2035. Eleven more reactors were scheduled to come on stream in the period 2012 to 2021, adding 13.8 GWe in total. However, in 2013 the government submitted a reduced draft plan to parliament for nuclear output of up to 29% of generation capacity by 2035, following several scandals related to falsification of safety documentation. This new plan still involved increasing 2035 nuclear capacity by 7 GWe, to 43 GWe. Nuclear power research in Korea is very active with projects involving a variety of advanced reactors, including a small modular reactor, a liquid-metal fast/transmutation reactor, and a high-temperature hydrogen generation design. Fuel production and waste handling technologies have also been developed locally. South Korea is also a member of the ITER nuclear fusion research project. Korea is seeking to export its nuclear technology, with a goal of exporting 80 nuclear reactors by 2030. 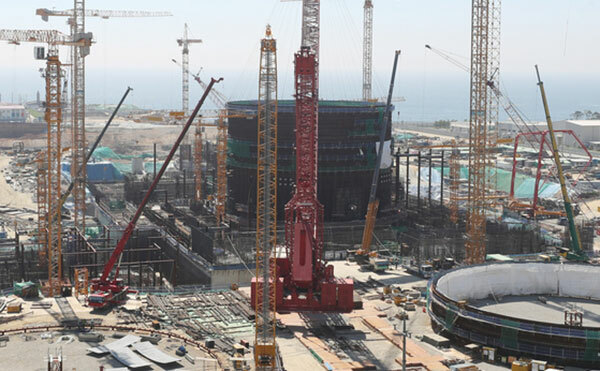 As of 2010, Korean companies have reached agreements to build a research reactor in Jordan, and four APR-1400 reactors in the United Arab Emirates. 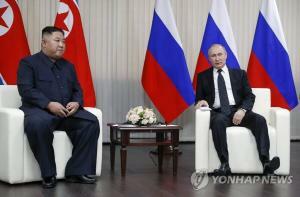 They are also pursuing opportunities in Turkey and Indonesia, as well as in India and the People's Republic of China. In December 2010, Malaysia expressed interest in procuring South Korea's nuclear reactor technology. In October 2011, Korea hosted of a series of events to raise public awareness about nuclear power. 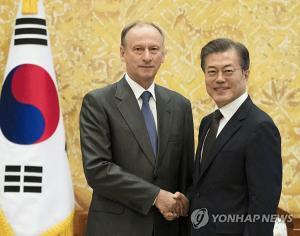 The events were coordinated by the Korea Nuclear Energy Promotion Agency (KONEPA) and included the participation of the French Atomic Forum (FAF); the International Atomic Energy Agency (IAEA); as well as public relations and information experts from countries that generate or plan to generate nuclear power. The East Coast Solidarity for Anti-Nuke Group was formed in January 2012. 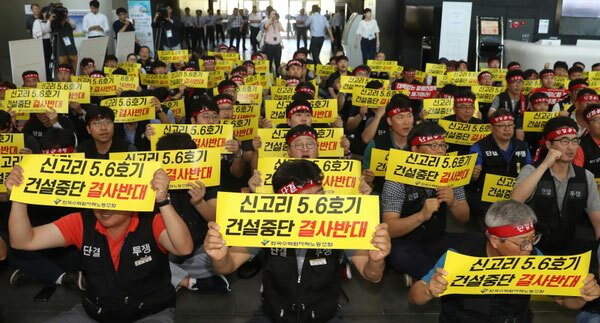 The group is against nuclear power and against plans for new nuclear power plants in Samcheok and Yeongdeok, and for the closure of existing nuclear reactors in Wolseong and Gori. Kori Nuclear Power Plant was the first plant in Korea to commence commercial operations in 1978. Since then, 19 more reactors have since been built using a mixture of CANDU (4 reactors) and PWR (16 reactors) technology. According to the Ministry for a Knowledge Economy, the APR-1400's fuel costs are 23 percent lower than France-based Areva’s EPR, known to be the most advanced nuclear power plant in the world. The government is also planning development of a new nuclear plant design, which will have 10 percent higher capacity and a safety rating better than the APR-1400. 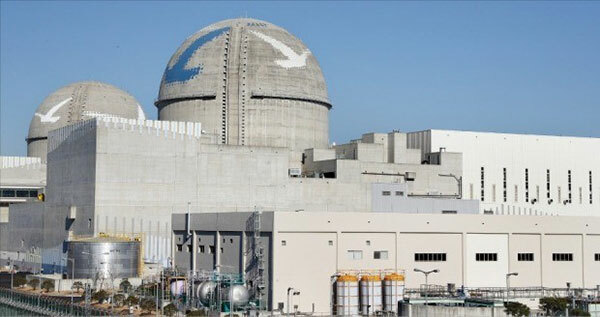 Korea’s nuclear power plants currently are known to be operating at a rate of 93.4 percent, higher than the comparable U.S. operation rate of 89.9 percent, France's 76.1 percent, and Japan's 59.2 percent. The Korean Atomic Energy Research Institute (KAERI) is a government-funded research organization. The Korea Power Engineering Company, Inc. (KOPEC) engages in design, engineering, procurement and construction of nuclear power plants. The Korea Institute of Nuclear Safety (KINS) functions as the nuclear regulatory body of South Korea. The Korea Atomic Intelligence Agency of Children (KAIAC) is dedicated to more research and development of nuclear power plants. It is also an educational organization that teaches children about power plants and nuclear energy. Anti-nuclear power plant movement in Korea. The "East Coast Solidarity for Anti-Nuke Group" will ask the government to cancel its plans for new nuclear power plants in Samcheok and Yeongdeok. They will also demand the closure of existing nuclear reactors in Wolseong and Gori, and release of information about them. 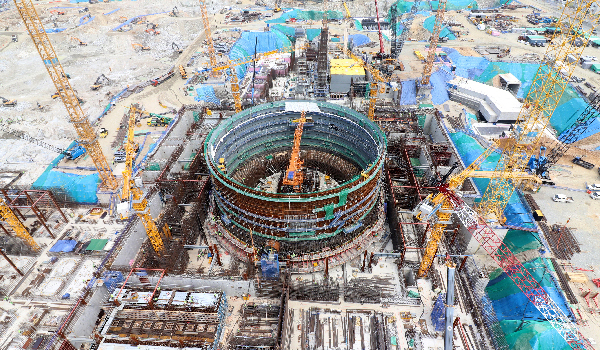 In 2014, an agreement was signed to allow construction of two additional APR-1400 reactors at Hanul (as Shin Hanul-3 and -4; construction to start no earlier than 2017) and two units in Yeongdeok County (construction may start by 2022). The proposed site in Yeongdeok would be named Cheonji and would occupy land in the villages of Nomul-ri, Maejeong-ri, and Seok-ri in Yeongdeok-eup. Samcheok had been previously selected as a new site for reactors in 2012, but residents rejected a reactor in a 2015 referendum. The population of Yeongdeok declined from 113,000 in 1974 to 38,000 in 2016, with one-third of residents aged 65 or older; the site for a new nuclear power plant was sought as a way to ensure the continued survival of the county.